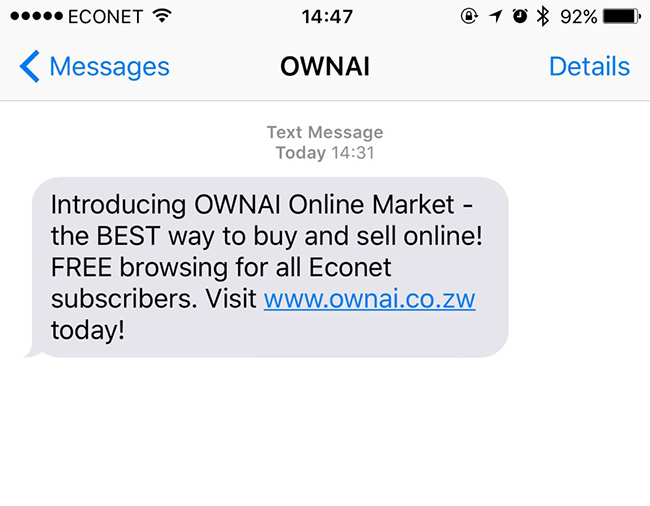 Ownai, the econet classifieds website, which launched yesterday, has been up and down this afternoon. Attempting to visit the website right now produces the error in the picture above. The message on shows that the database of the content management system they are using, Osclass, is unavailable. The website could be buckling under the pressure of many visitors coming at once. The company just sent out an SMS to all its subscribers (see image below) in Zimbabwe telling them they could access the website for free. It’s zero rated. Most of their subscribers could have tried to access it at once. Someone might have hacked them, again, possibly with a distributed denial-of-service (DDoS) attack, which would hit the server that’s hosting the database to an extent it won’t respond anymore to genuine visits. If it’s the first case, it’s both good and bad news for the operator. Good in that clearly there’s massive demand for a free classifieds website which means lots of uptake immediately. Bad in that the database likely fell over because of the lack of proper planning or configuration of the servers for potential demand. If it’s someone that’s hitting them again, then that just means whoever is doing this has made it their mission to keep disrupting Econet, apparently until they start playing fair. Whether it’s the “too many visitors” or hacking however, exposing the platform being used is not a good thing for a company that’s already targeted by hackers. What do you expect from an Open Source project? Am sure whoever implemented just deployed with the default settings. I hope Econet didn’t pay an arm and a leg for this. And this, ladies and gentlemen, is how you clearly expose your ignorance on a topic that eludes you. Don’t blame the Open Source project they used – its not responsible for LAMP stack optimisation ultimately and they offer no visible recommendations for server config. Most operating system default web server configs are far from optimised for high traffic, It takes a somewhat specialised approach to optimising. starting with understanding the site software and traffic expected as well as the right resourcing of the server. I also think it was a bad idea they decided to host it themselves. They should have done what big companies do, hosted it on Amazon that way some of the complex aspects could easily be handled for example scalability and availability. There is no shame in doing so consider Ubuntu themselves use Amazon. 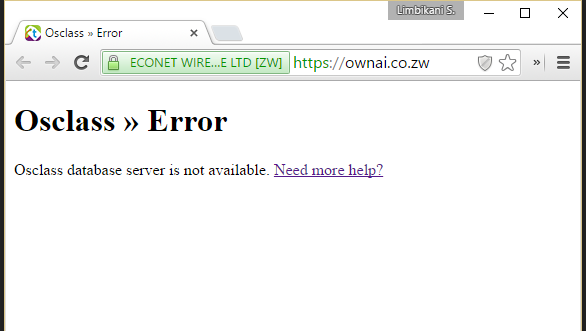 Its on an Econet IP – it can’t be on AWS! Goes to show that a lot of people want to use the service espeically considering it offers free browsing. Probably best not to send SMS to all subsribers at once if that’s indeed what they did. Guess they’ll learn from that. Too many people trying to access at the same time will be chaos for any site. Too many people trying to access at the same time will be chaos for any site. Listen too many people isnt a problem dont they have bussiness analysts who tell them that if they send an sms to 6million people abt maybe 15% will check it out and them scale the service to this. Ps the could host the site themselves bt use cloudflare to filter ddos attcks until they figure out how to do it themselves. 15 servers for 1000 visitors?! That sounds like way too many servers. You don’t want every request hitting your DB server: so you add reverse proxy, cache prerendered HTM (varnish), and cache hot records aggressively (memcache). A visitor should *never* see a DB error: the site should still load (slowly) or 503. Econet is just showing out of it’s depth, yet again. And they have the gall to complain about OTT players “reaping where they did not sow”- sorry, you are just not an Internet company. That’s a scalable architecture as you could add more servers to whatever role a bottleneck might appear (load balancing/ app /obj store / DB). I’m going to guess the app servers were the most stressed? With that loss-rate, sounds like they could afford more than just the mini-farm. Thats where we have a problem in africa all developers should learn about markus frind and plenty of fish. 500 million hits a month over 50 million users with 5 servers 1 worjer who works 6 hours a day and running on asp and microsoft sql. With too much money at times you are forced to think inside a box ownai should start using mickey mouse solutions those will help them build something they can scale without blowing their money on hosting. Or better yet syeal technicians from webdev to see they manage what they do. Nothing wrong with OS platforms. They just need to ensure their servers can handle all the traffic the site is receiving. Guess it’s still early days and they’ll now realise the service is more popular than even econet had expected. Doubt they’re too concerned about this – although I’m sure they now wish they had provided more capacity from the get go. Will be interesting to see if ownai will really be as popular as today would seem to indicate. I have nothing to buy bt lm loving the site, maybe oneday l will buy something, if l get someone selling goats and donkeys. tengai went down and hacker(s) claimed responsibility. so far none have claimed downing ownai. however the same hacker will try/has tried to take out ownai. Could Econet give ownai (or it’s next iteration) a hand while “playing fair”? Seems to be working just fine for me. Just posted and ad. Like the site on mobile. Haven’t yet checked it out on my desktop. Cool Econet. Chimbo vhurai highscalability.com, then moona zvirikuitwa nevana vevamwe. Ndo paunotoona kut argghhh, ownai iyi iri kugadzigwa nevanhu vasinga zivi zvavari kuita.